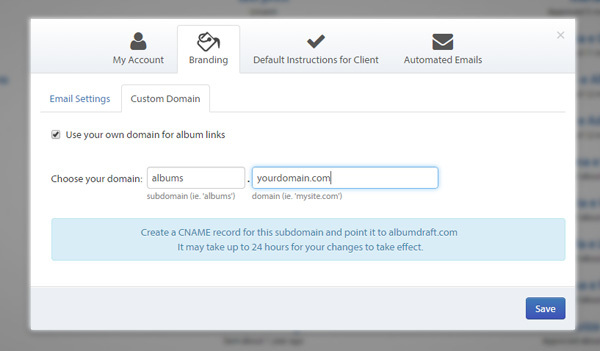 How to use your own domain for the album link sent to your clients. 1. Sign in to your domain/hosting service provider. 2. Add a new DNS record with a type of CNAME. The name of the record should be your desired subdomain (such as ‘albums’) and the value it should point is: albumdraft.com – Save this new record and you’re done with the second step! 3. 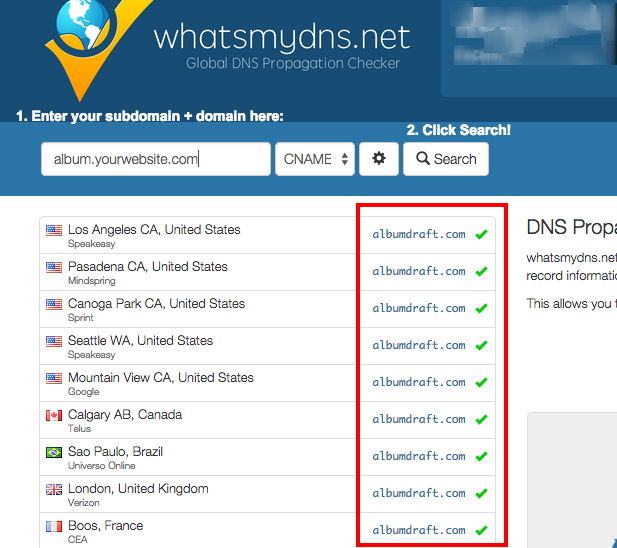 BEFORE SETTING YOUR CUSTOM DOMAIN ON ALBUMDRAFT: Try this online tool and see if it’s working: https://www.whatsmydns.net/#CNAME/ – Enter the new subdomain and see if you get the green checks (see image below). It may take a couple of hours for your new DNS record to propagate over the internet. Use this tool to check if your subdomain is working.